Having other children in the delivery room is an option some parents choose, however, parents need to be prepared for every possible scenario. First, contact the hospital labor and delivery floor to make sure children are allowed in the delivery room. Next, enlist a volunteer to care for your children in case there are complications that require your child to leave the room. Finally, have a plan in place for childcare if labor starts while children are at school, including a dedicated, approved pick-up person and after school instructions. Even if children are not allowed in the delivery room, they don't have to miss out on everything. 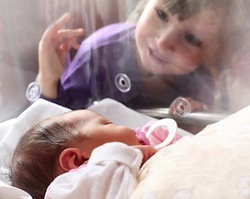 Children are often allowed in the room during the labor process if not the delivery itself. Also, hospitals tend to have free Wi-Fi, so mom can bring along a laptop or tablet and talk with the children using Skype or another means of audio or video communication.